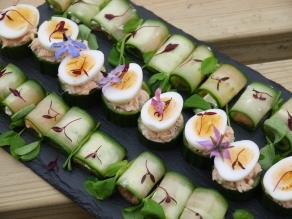 "Cookery school of the year"
Orchards Cookery specialises in training and recruiting Chalet Cooks and also runs Off to University courses, Designer Dinner party courses, Corporate Days and One and Two Day cookery courses. 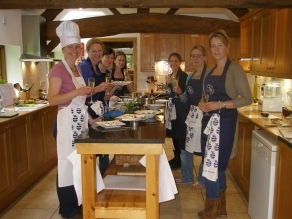 The Award Winning cookery school has a new approach to cookery and tuition, courses are 'hands on' and lots of fun, each day concluding with a dinner party. Orchards Cookery also offers a recruitment service supplying cooks for ski chalets, private parties, shooting, hunting and fishing lodges, holiday villas, yachts etc. The Orchards is a family home situated on a farm in the heart of England, near Stratford-upon-Avon and students live in cottages on site. 2013 - Cookery School of The Year and the Best English Cookery School in the British Cookery School Awards (also 'Highly Commended' in the Best Specialist Cookery School category and finalists in the Best Large and Britain's Favourite Cookery School categories). The homely, welcoming family atmosphere. Small class sizes of 8 students per kitchen with the fun of having up to 48 students staying at the school (we have a high staff to student ratio of one member of staff for every two students). Accommodation on site (included in the fees for five day and two week courses), so students can enjoy a glass or two of wine during supper. Our courses are intensive - we cover over 100 different dishes during a five day course. Courses are great fun and each day concludes with a dinner party. Courses are designed so that we can train groups of mixed abilities, making all courses suitable for both complete beginners and more experienced cooks. Our short courses have proved to be extremely successful - short enough for students to remain focused and enthusiastic about cooking but long enough to turn a complete beginner into a competent cook. Recipes used are quick and easy but impressive, chosen specifically so that we can teach as many different techniques on a course as possible. They are also easily reproduced at home with ingredients that can be found easily! Our cookery books with 100’s of delicious foolproof recipes that work every time. 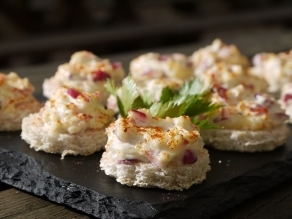 We specialise in training and recruiting Chalet Cooks. The recruitment service we offer to our students and ski companies. We organise ski company presentations and interviews at the school leading to most students receiving one or two job offers while on a course. In the past we have had a 100% success rate at helping students who were really determined to find a job. Wine Tasting evening available to students on a two week course. Our five day and two week courses qualify for The Residential Project of The Gold Duke of Edinburgh’s Award. Students involved in the International Baccalaureate Diploma programme can do one of our five day courses to fulfil the creativity requirements of their CAS. The extensive kitchen garden where we grow our own herbs, fruit and vegetables, otherwise most ingredients are sourced from local suppliers. 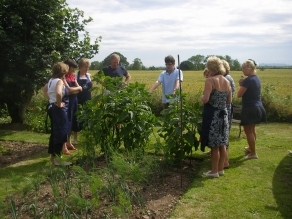 Students are taken on a tour of the kitchen garden to see how some of the produce they use during their course is grown and harvested. Reputation - most students hear about us through word of mouth and come from all over the world (we train over 500 students a year). We are lucky enough to attract delightful, fun and enthusiastic students who are keen to learn and make new friends. Purpose built domestic style kitchens equipped with Miele appliances, rather than a stainless steel set up with commercial equipment. Courses give students the confidence, skills and enthusiasm to cook professionally. 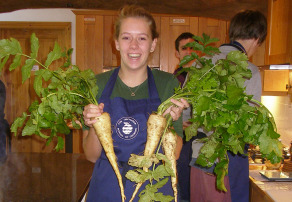 Many students go on to cook in chalets, villas, hunting, shooting and fishing lodges and on yachts etc.